Are Personalized Vitamins Better Than Buying at CVS? We've all been there: standing in the drugstore aisle, staring at rows upon rows of vitamins and supplements. Which ones do I really need? Will a multivitamin take care of everything? Where should I even begin?! That's where personalized vitamins come in. Recently, companies like Binto have begun to sell personalized vitamins for a range of different dietary needs. Basically, all you need to do is answer a few questions, and the company will do all that work for you, determining which vitamins and supplements you really need (and which ones you don't). Customized vitamin packs for your unique health and wellness needs: It sounds almost too good to be true. But is it? Well, as it turns out, the curated vitamins trend is actually very much legit! Keep reading as Suzie Welsh, RN, founder of Binto, busts myths and explains the facts behind personalized vitamins. All you need is a multivitamin. A lot of research has shown that taking multivitamins doesn't actually make that much of a difference in the long run. That said, it's hard to over-generalize and deem all multivitamins ineffective, Nurse Suzie explains. What's scary is that the supplement isn't regulated at all by the FDA! "That means that just about anything could be added into a multi like preservatives and toxins", Nurse Suzie says. Also, they are filled with a lot of excess vitamins and minerals that you do not need and you just end up peeing out. So, what sets Binto's multivitamin apart? "We're of the 'less is more' approach, so our multi provides only what your body truly needs — and not the excess vitamins and minerals you don't," Nurse Suzie explains. Binto supplements contain zero preservatives and fillers, are non-GMO, and are organic where possible. It's easy to figure out which vitamins and supplements you need on your own. Not so fast. The vitamin aisle is an overwhelming place, and there's nearly endless information available online about which vitamins and supplements are best for you. The catch? We're all very different people with very different health needs! That's why Binto designed our online survey. Our easy-to-take quiz gathers pertinent information on your health stage, goals, period health, hormonal imbalances, nutrient needs, etc. "As a nurse, I learned how to gather and collect health histories, so that part was really exciting and fun for me," Nurse Suzie explains. "Then it was a matter of laying things out in a fun and easy fashion, so we don't lose you with a boring quiz!" Then, Binto uses that information to match you with the right nutrients. "The data also helps us detect trends in women's health and lifestyles so we can target those trends, provide more education, and continue out supplement research to make sure we help you meet your goals," Nurse Suzie says. Even if you eat healthy, your diet might still lack certain essential nutrients. Although you eat plenty of fruits and veggies, chances are you're still falling short on some key nutrients. For instance, women need more iron than men do, since they lose iron during their menstrual cycles each month, as well as during pregnancies. Another helpful supplement you'll find in a personalized vitamin pack from Binto: probiotics and digestive enzymes, which can offer a host of benefits for women who have digestive issues. Finally, vitamin D is another key nutrient many people miss in a basic multi. Many people don't realize they might be deficient, even if they live somewhere where the sun's always shining. Personalized vitamins like Binto can also help fill in the gap for other nutrients including: magnesium, DHA/EPA, biotin, and B vitamins. "Personalization" is just a marketing buzzword. Personalization is way more than just marketing! "Not all bodies are the same, especially when it comes to women's health," Nurse Suzie explains. "You might be trying to get pregnant while your friend is going through menopause — those are very different physiologic things occurring that require different nutrients. Think about it this way: If you have straight, limp hair, and your friend has thick, curly hair, you each require a very different shampoo and conditioner. It's the same when it comes to your hormones and life stages of wellness. Personalized vitamins could be cheaper than your current meds. This may be the best news of all. Did you know that prescription prenatals have a copay of $60 to $120? That's just for a prenatal, and none of your other supplements. Proactively supporting your health and wellness can also save you a lot of money or sick care and medical bills down the road. 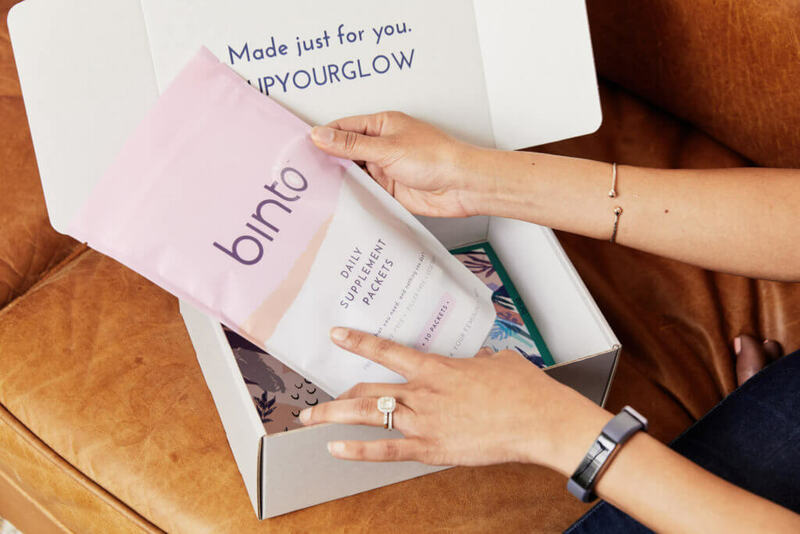 Binto's personalized vitamin packs start at just $35 per month, and it will never cost you more than $55 per month for all your supplements. Take our survey to get started right now!